This interchangeable earring set allows you to be your very own stylist and change up your look. 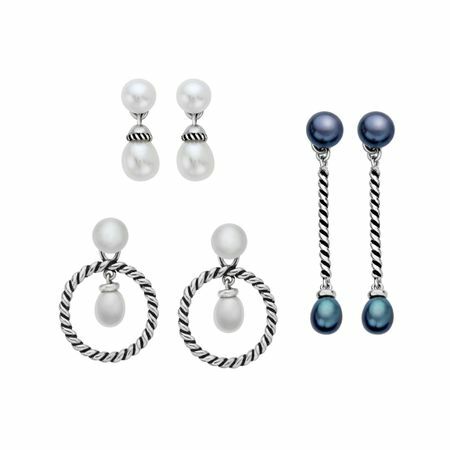 These pearl earrings can be worn interchangeably as button or drop and feature a mixture of white and black freshwater pearls measuring 6-8mm set in sterling silver. White mini drops measure 13/16 by 5/16 inches. Black drops measure 1 3/4 by 1/4 inches. Hoops measure 1 1/8 by 3/4 inches. Join our mailing list for access to exclusive news and updates.